It has been announced today that FanVision will not be providing coverage at Formula One races for 2013, after failing to reach an agreement with Formula One Management over the required rights. The FanVision handheld device provided comprehensive coverage for fans, teams, the media and more at the circuit, offering a fantastic overview of the all action wherever people were stationed. We've long been excited about the device, from the very early days of Kangaroo TV, through the transition to the FanVision product that it is today... or should I say was. FanVision do, of course, cover other sports including NASCAR and the NFL, but for F1 in 2013, the dream is over. A statement from the group was simple and to the point. As you know we have, for some months, been trying to find the basis of an agreement between FanVision and FOM in order to continue providing the service in F1 in 2013. Unfortunately it is now clear that we are not going to be able to agree terms with FOM and very reluctantly we have to confirm that we won't be in F1 in 2013. It's a big blow for us. It is a big blow for fans too. The reactions I've seen today fall into two camps - those who are very disappointed at the news, and those that can see it leading to better things in the future. Such optimism can be very handy, but FOM do not have a great track record when it comes to providing timely and relevant information in a fan-friendly format. With only three months to go until the season begins, there isn't a lot of time for them to pull something amazing out of the woodwork. Whilst going to a Grand Prix is as much about the atmosphere and seeing the action up close as it is about the racing, the loss of FanVision certainly makes the idea of going to a race far less appealing to me. The device was the perfect accompaniment to seeing the cars circling live, giving powerful personalisation tools to the live timing and coverage screens, and more recently providing options for listening to various commentaries as well. Now visitors will be stuck with the trackside commentary which can only be heard if you're in precisely the right position and the airhorns aren't blowing too loud. There is a lot of scope for where this kind of technology can be developed in the future, and FOM have tried to make the leap into mobile devices with their live timing app. However, apps are reliant on mobile coverage or wifi which can be spotty when many people gather in one place or you happen to be in the depths of the countryside. FanVision's custom solution mitigated all of those issues and it will be a tough ask to replace their many years of experience in the short term. Of course it's not just fans who suffer, either. 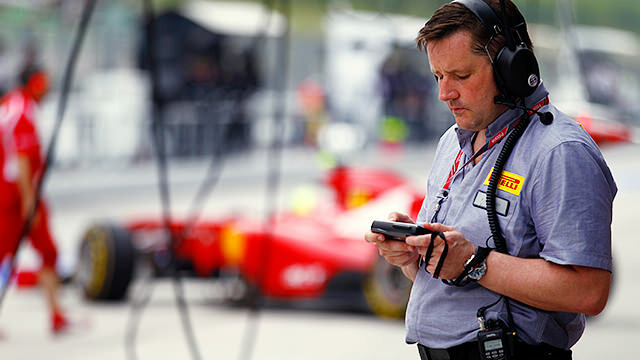 We've seen lots of team personnel with FanVision devices in their hands, and Paul Hembery of Pirelli is infamous for having his eyes glued to the screen. Those in the media centre are keen on the device, as well as the pit lane reporters who would otherwise miss a lot of the action being stuck in their little corner of the paddock. There is another unintended consequence that I hadn't even thought about too, as pointed out today by Michelle, a member of the FIA medical team. Not just the media - medical team at some races had them in-car so we weren't responding blind! What is amazing to me is how quickly the device has infiltrated the F1 world. To lose it leaves me feeling quite bereft - and I haven't been to a race in a while. Formula One Management really do need to have an alternate solution up their sleeves, because to deny the use of something so important, useful, and just plain awesome without providing an alternative is not being fair to anybody. Today is a bad day for Formula One.